Recording and editing video on a mobile device or tablet doesn't mean you're less qualified or that the quality of your work will be poor, but you do need some software to get it from just footage to a video package. 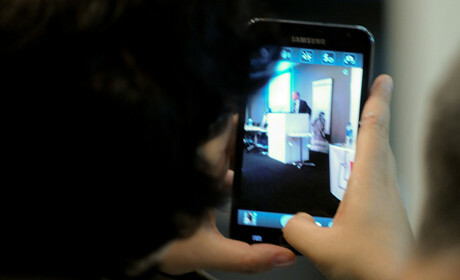 Getting to grips with mobile journalism can be useful if you're reporting from a remote location or if you happen to be at the scene of an event as it unfolds. There are plenty of good video editing apps available, but here are five free ones that you can easily use to make your videos stand out. This app makes video editing easy even for beginners, while also allowing you to make use of a number of features, such as filters, transitions and audio mixing. 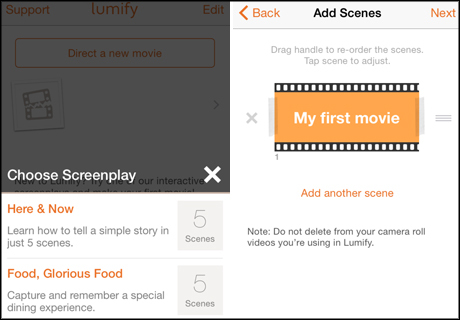 Creating a 5-scene video in Lumify is simple: you can add footage and pictures from your camera roll, record on the spot or both. There's also an option to add titles, slow down or speed up scenes and "pan" static images to make them look more interactive. You can browse movies created by others if you need inspiration and the latest update also allows for use of Snapchat videos in your movies. The only potential downside about this app is that it requires 1GB free space on your device to 'function properly', so make sure you have it to avoid the app crashing halfway through the editing process. Magisto allows you to shoot or use pre-recorded video and photos, although it encourages users to share a minimum of 15 seconds of video, five photos or mix and match. After uploading your footage, you can choose an editing style from the pre-set list, add a soundtrack and titles and you're good to go. Editing styles include certain elements, so while 'storyteller' will suggest you upload a piece to camera and let the app do the rest, 'adventure sports' will automatically apply sharp transitions and slow motion effects to your video. If you're not happy with the end product, you can go back and edit individual parts, rather than starting all over again – handy if you forgot to include a relevant piece of footage. We wrote about Vyclone back in 2012, due to its feature that allowed up to four people in the same location to record and combine their video footage. The app has been updated since and you can now do the same thing with people all over the world, not just in your area. For journalists, it could be useful if they want to portray an event, such as a protest, from different angles and give the audience the ability to contrast and compare its impact across multiple locations. To discover what others are filming and join in, you need to enable location services on your device. Once you have your footage, whether new or existing, you can add the standard filters and audio, as well as hashtags and comments before uploading. 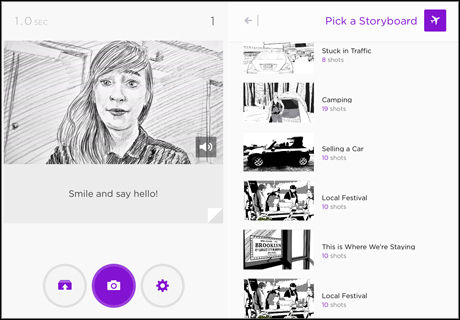 This app, recently bought by YouTube, brings a new element to video editing: storyboards. You can record or upload an unlimited number of scenes of any length – although the app will give you some guidance on the right duration – trim scenes and add captions. There is also an option to add voiceovers or interviews, as well as music, titles and animations. You need to register in order to access all storyboards, which include 'local festival' or 'road trip' and have pre-set shot lists and step-by-step instructions on what scene you should film next. Splice is very straightforward and its design bears some similarities with Final Cut Pro, useful if you're already familiar with the program. When you open the app, you will be prompted to upload or record your footage and images, which you can add effects and animations to. There is also a comprehensive audio library, but you're welcome to add your own narration or existing tracks from your device. 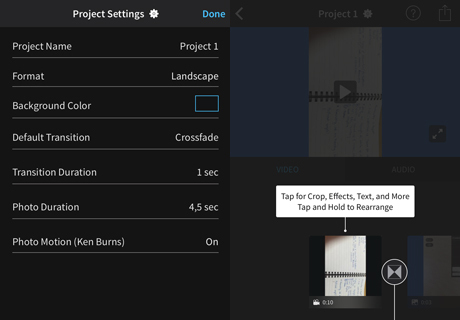 Splice also lets you add transitions, set their duration and decide the duration of your pictures. Once you've done that it displays the final video, but you can see all the elements that make it up in an editing channel below and adjust whatever necessary before exporting. Have any more recommendations? Let us know in the comments below and check out some more tips on getting started in mobile journalism and shooting mobile video.